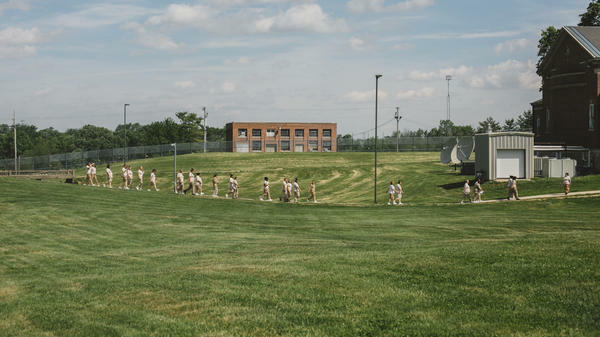 Women walk through the courtyard to lunch at the Indiana Women's Prison in Indianapolis on May 17. Vanessa Thompson (left) came up with an idea for rehabbing Indiana's abandoned homes that would also help felons re-entering society rebuild their lives. Andrew Falk (from left) works with former volunteer Kelsey Kauffman, Michelle Jones and Natalie Medley in the housing policy class at Indiana Women's Prison in Indianapolis on May 17. At the oldest prison in the U.S., on the west side of Indianapolis, Vanessa Thompson sat on a bunk in her cell, watching television. It was early 2015, the 17th year of her incarceration. During her first several years at Indiana Women's Prison, Thompson piled up more than two dozen misconduct tickets for disrupting the prisoner count, arguing with staff, selling her psych meds, and abusing Benadryl and cough syrup from the commissary. Underneath all that chaos, she felt a deep shame for letting down her two children, one of whom ended up in prison himself. But as she matured and teachers recognized her strengths, Thompson steadied herself. By 2012, she was enrolled in the prison's higher education program, taking a special interest in one of the most popular courses offered: public policy. The class of about a dozen women studied civic literacy — how to write policy proposals, contact elected representatives and talk to the media. Every session, they pored over the fine print of bills then under consideration by the Indiana state Legislature, especially those related to incarceration, drug addiction, domestic violence and sexual assault — the issues they knew best. They held mock committee meetings and looked for clauses they thought could be amended. What if, she thought, people re-entering society from prison helped rebuild those homes, and then, after putting in several thousand hours of construction work, got to live in one? This would also help solve a second intractable social problem: the lack of housing for ex-offenders, which had helped send so many women she knew back to jail. "It's a double restoration — not just of the house but of the person," Thompson, now 44, said in a recent interview. "What does Indianapolis need? A solution to this housing crisis. What do women in prison need, more than anything? Ownership. Of our minds, of our bodies, and of our physical homes." They found a textbook on low-income housing policy and divided up the chapters. They met or held video chats with Habitat for Humanity, YouthBuild, Yale Law School and local community development corporations to learn about sweat equity. At the chow hall, they joked about getting some pink hard hats to wear and debated what their prisoner-re-entry program would be called, settling on "Constructing Our Future." A supporter set up a GoFundMe page, and the women wrote grant proposals to raise $200,000 for tools and equipment and to pay the salaries of a small program staff. They also recruited a complete executive board, including a state legislator and a top staffer at the Indianapolis mayor's office. They brought on an executive director, Andrew Falk, who formerly worked at the Indiana Attorney General's Office defending the state against prisoner appeals and now is a senior fellow at the Sagamore Institute, a public policy think tank. "I've been in prison for two decades," she said. "And I always thought, when's it gonna be they take me seriously?" 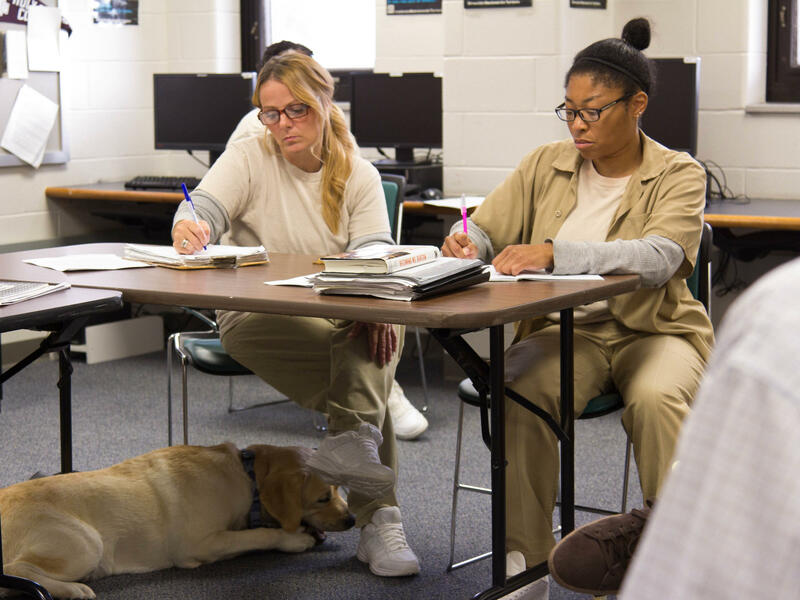 Enter Kelsey Kauffman, a former volunteer teacher at the Indiana Women's Prison who in 2012 single-handedly created the program for Thompson and the others. "If it wasn't for her unbelievable personal will, it would not exist," said John Nally, director of education for the Indiana Department of Correction. The prison is the only maximum-security facility for women in the state. Kauffman, 70 and a new grandmother, calls herself a "prison gadfly." She was one of the first women to graduate from Yale University — before promptly becoming a corrections officer. She said she became fascinated by incarceration after the 1971 revolt at Attica Correctional Facility in New York. She has also written a book about the toll prison takes on the humanity of guards and inmates alike, and she became a national expert on white supremacist influences among corrections officers. Kauffman describes herself as politically radical but is highly practical in negotiating with prison officials and navigating byzantine rules to garner support. She has a fierce belief in the women's capacity to create, regardless of their crimes. "Women in prison aren't thought of as public policy experts," she said. "But who knows more than they do about key issues like domestic violence, inner-city 'food deserts,' and what it takes for a mother to survive with her children on the streets of Indianapolis after she is released from prison?" As is often true of women in prison, nearly all of the Indiana Women's Prison students have been victims of sexual assault or domestic violence. One was convicted of burning down her estranged husband's house after years of being assaulted. Another was convicted of attempting to have her ex-husband, whom she said had been abusive, murdered. Another was convicted of child neglect for failing to stop her husband from beating their baby to death; two others were drug addicts convicted of committing homicide while they were high. Because those crimes invite judgment, Kauffman preached the importance of appearance and speaking in slang-free English before the legislature. When looking for issues to bring to lawmakers' attention, she taught the students to "leave to the ACLU" more controversial topics such as solitary confinement, which could make them seem like self-interested activists rather than policy experts. "I never would have known my power as a citizen... if I hadn't become a prisoner. Imagine that," said Kristina Byers-Escobedo, 39, who is serving a 30-year sentence on a child neglect conviction. 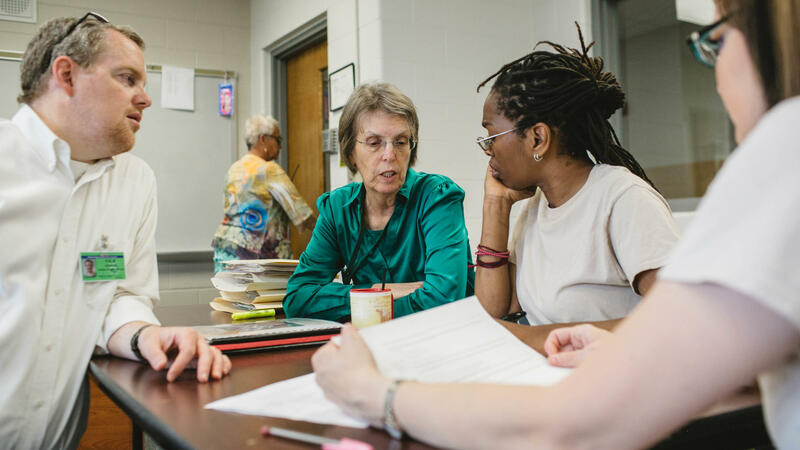 At a time when the incarceration of women, relative to men, is on the rise — and with about 75 percent of state prisoners getting rearrested within five years of their release — Thompson and the women at Indiana Women's Prison hope their new re-entry program can be a concrete and inexpensive national model for providing ex-offenders with both housing and a marketable skill. After the legislature's unanimous resolution this spring, Correction Commissioner Robert Carter wrote to the students and to Macer, the state representative, congratulating them for "thinking outside the four walls of the facility." But he noted that he could not guarantee their idea would be fully implemented as they proposed it. The women are concerned that officials will implement it for the state's male inmates. "Our labor is often discounted as women; if they give us vocational programs at all, it's always something like cosmetology instead of auto repair or forklift driving," said Toni Burns, 44, who is serving a 30-year sentence on an attempted murder conviction. "This may not be for us personally, but it has to be for women." Meanwhile, they still need to find a home base for the program, envisioning a large apartment complex in East Indianapolis where participants would stay after being released from prison while completing their 5,000 hours of sweat equity. Their dream is for the state to hand over the old women's prison facility, recently shuttered. "Most of us in here have low self-esteem, co-dependency issues, and struggle with being persistent and dependable," Thompson said, noting that she and others in the class may not benefit directly from the program because they are not due to be released for many years. "Half of our families have passed away while we've been inside... All the women [who] come here and live off of the state just go out and continue to do that." But she hopes the program's strict admissions process and promise of a safe, affordable home for ex-offenders and their children will offer the chance of a better future. "All the politicians are so concerned about what happens when us prisoners go home," said Thompson, whose own 18-year-old daughter was so moved by what her mom has accomplished that she plans to visit the prison in the coming months; when they last saw each other, she was 3. "Well, our question was: What's home? Let's try to answer that." Inmates in state prisons face many challenges when they make the transition to the outside. In the U.S., three quarters of them will be arrested for a new crime within five years. In Indianapolis, some inmates have come up with a plan to help former prisoners and the city. From member station WFYI in Indianapolis, Drew Daudelin reports. UNIDENTIFIED MAN: Let's look at the "Treat Incarcerated Women With Dignity" article. DREW DAUDELIN, BYLINE: If you visit this room filled with tables and computers, it's nearly impossible to tell you're inside a maximum-security prison - no metal bars, no security guards nearby. It looks like a typical classroom complete with a teacher and an attentive group of students. But the students here are inmates at the Indiana women's prison. Vanessa Thompson is 44 years old and was convicted of murder 19 years ago. Two years ago, as a mayoral race was kicking off in Indianapolis, Thompson was watching TV in her cell when she saw a candidate mention the thousands of abandoned homes across the city. VANESSA THOMPSON: I started coming up with all these ideas. How can we be a part of helping him take care of blighted neighborhoods and in the process give back to community and be more than what the stigma says we are? DAUDELIN: It was a eureka moment for Thompson. THOMPSON: I know that a lot of the women here face the issue of having a safe environment a stable home to go to. DAUDELIN: Vanessa Thompson brought the idea to her teacher, and the class started fleshing it out. Here's how they see it working. Women at the prison learn construction skills. In their final years before release, they're sent in groups to rehab abandoned houses in Indianapolis. Once released, if they work for at least 5,000 hours, they can buy one of them at a subsidized price. Within months, Thompson was explaining her idea to lawmakers. Two years later, the House and Senate voted unanimously to support the proposal, but they didn't fund it. But the support represents vindication for women like Sarah Jo Pender, a 38-year-old convicted of double murder in 2002. Pender says being taken seriously has had a profound effect on women in the group. SARAH JO PENDER: There's an untapped source of intelligence in prisons. I've watched women grow who did not want to say anything. And they would just giggle and laugh and look down and now can speak into a microphone and know that somebody cares. DAUDELIN: This process of self-restoration through hard work lies at the core of the program's philosophy. Ann Jacobs heads the Prisoner Reentry Institute at the John Jay College of Criminal Justice. She says it's about self-determination. ANN JACOBS: I mean, you've got a system that tells people when to get up and when to go to bed and when the lights have to be off. So it undermines agency and initiative. But there are correctional administrators who aren't threatened by that and who do foster it. DAUDELIN: The inmates hope that partnerships with the city and the Department of Correction will help turn the idea into reality. The women learned how to write grant proposals and have set up a crowdfunding page online. Andrew Falk is a public policy analyst and helps coordinate the project. About once a week, he meets with the women in the prison's classroom. Falk spent years working for the Indiana attorney general. He says his focus on prosecuting cases made him rethink the effectiveness of the state's prison system. ANDREW FALK: We cannot live our life in fear. We cannot live our life with them segregated. We're not going to ship them off to Australia as a penal colony. They're going to be coming back and living in our society. And I want them to be as successful as possible. DAUDELIN: Falk and the inmates are now focusing on raising enough money to help restore both the city's abandoned homes and the lives of the prisoners who need them. For NPR News, I'm Drew Daudelin in Indianapolis. SHAPIRO: And this reporting is part of a partnership with The Marshall Project and member station WFYI. Transcript provided by NPR, Copyright NPR.